The best bathroom scale today would accurately and consistently tell you how much you weigh now. It’s a must-buy if you are serious about losing or gaining weight. Having one in your bathroom can let you keep track of your weight almost every day. Of course, when you buy bathroom scale, the first thing that you are expecting from it is accuracy. It should be accurate so that you can trust its weight reading anytime you use it. But it wouldn’t hurt, too, if you can get a bathroom scale that can do more than giving you an accurate reading of your weight like telling you your body mass index or body fat percentage. There are basically three kinds of bathroom scales—analog, digital, and high tech. The analog scales are the most basic unit, so they’re also the most affordable. Also referred to as mechanical scales, the analog bathroom scale operates on a spring mechanism. It has a large foot platform and dial that is easy to read. It also doesn’t require batteries, too. Digital scales are more accurate than analog scales. But these need a battery to operate. Most models have memory capabilities, able to store previous weight readings. The most advanced type is the high-tech bathroom scale that can calculate body fat percentage, track BMI, and also transfer information to your computer, smartphone, or tablet. There are other talking scales that are designed for the visually impaired. Most of the top rated bathroom scales have a sleek and compact design. This is pretty important if you don’t have much floor space. A good bathroom scale has a tempered glass platform, protecting its surface from water. It must also have a durable plastic housing underneath. If you’re concerned that you are too heavy for a bathroom scale, then get a heavy-duty unit instead. In case you are to place the bathroom scale on a carpeted floor, make sure that the unit has rubberized feet on the bottom. You must know the weight capacity of the bathroom scalebefore buying one. Bathroom scales have different weight capacities, although most units can accommodate up to 400 pounds. If you weigh more than that, then look for a heavy duty weighing scale. Bathroom scales should not confuse you at all. It must beeasy to set up and use. The best bathroom scale often works on a couple of batteries. After inserting the battery, you either tap on the bathroom scale or you simply step on it. Many people prefer the latter though, as a bathroom scale where you just step on the unit and it instantly shows the weight reading is deemed more convenient. EatSmart Precision Digital Bathroom Scale can accurately measure people weighing up to 400 pounds. It makes use of high precision sensors for accurate and consistent measurement of weight. The bathroom scale has a tempered glass measuring 8mm thick, with a non-slip top and a large platform measuring 12 x 13 inches. It is about 2 inches high. It is pre-set to pounds although you can change it to kilograms by pressing the toggle button under the scale. There are many things I like about this bathroom scale. One is that there’s a free EatSmart body tape measure included in the package. Another thing that you’ll appreciate about this digital bathroom scale is that you simply tap on it to activate the scale. Then step on it and you’ll know your weight. It is also very sleek, with a large backlit display that makes it a lot easier to read your weight. It’s also easy to use. You simply step on it after it reset to zero, and your weight will be displayed in a matter of seconds. When you step off the bathroom scale, it resets to zero and thus ready to be used again. It also powers off automatically to conserve energy. Finally, it has a very affordable price that should make it a good choice for the budget-conscious shopper. But there are also some drawbacks to this bathroom scale. The most common issue raised against it is that it doesn’t really get activated when you tap on it. Balance High Accuracy Bathroom Scale , another bathroom scale that you may want to add in your bathroom.It is powered by two Lithium ion batteries that are already installed in the product. There’s large, backlit LCD where you can see your weight readings. This is a self-recalibrating bathroom scale. This means that it automatically turns off itself after you are finished weighing yourself. There are four weighing sensors in this bathroom scale designed to give more accurate readings. This bathroom scale can accommodate users who weigh as much as 400 pounds. It has a large, tempered glass weighing platform that is sturdy enough for big people to step on. There are plenty of reasons to buy this bathroom scale. For one, I appreciate that it has a sleek and modern design. It doesn’t take up a lot of space, so it would fit under a chest of drawers. Many reviewers .com also suggest that this is a pretty accurate bathroom scale. It can deliver readings fast, with 0.2 pound increments. It has a large LCD screen with a bright blue display, thus you will be able to read your weight right away. I also like that it is pretty durable. Many reviewers .com say theirs have lasted for a lot of years. They say it is made of high quality materials. They also speak fondly of its thick glass top. But there are questions on its durability. Some unimpressed owners also say their units used to be accurate; which isn’t the case now. Kinzi Precision Digital Bathroom Scale, another digital scale that you might want to have in your bathroom. It is also capable of weighing up to 400 pounds, with increments of 0.2 pounds.It has German high-precision sensors that make it capable of displaying accurate weight readings on a consistent basis. It runs on two AAA batteries. This bathroom scale has pound as its preset unit of measurement although users have the option to change it to kilograms and stone. When not in use, it will automatically turn off to conserve power. 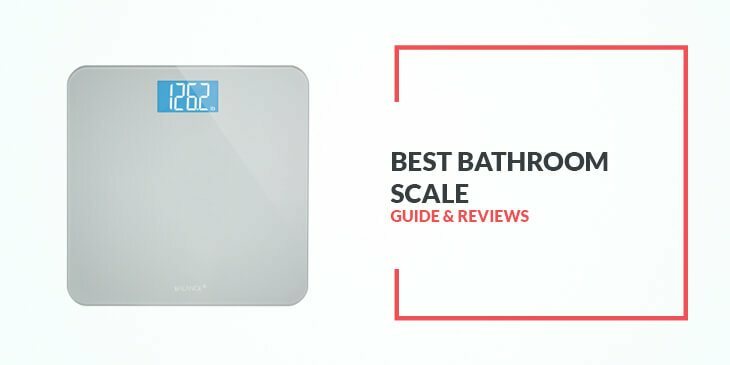 This is a highly rated digital bathroom scale, with many reviewers .com giving it a lot of praise. They say that it doesn’t take up a lot of space in the bathroom, measuring 11.7 inches wide and about 12 inches tall. It is also not that heavy at just 3 pounds, so you can move it when the need arises. Using it is very straightforward as well. Simply insert the two AAA batteries in the battery compartment found on the back of the unit. The blue backlit LCD screen will then lit up, indicating that it is ready to use. Then step on the weighing scale and it will flash your weight reading. The digital scale also looks very contemporary that makes it a very stylish addition to any bathroom. Its display is also bright and large. There are those people who feel that this unit should have at least come with AAA batteries. Others aren’t also impressed with the bathroom scale saying that it can be inconsistent at times. Etekcity Digital Body Weight Scale can also be used by people who weigh as much as 400 pounds.It makes use of advanced, high-precision sensors that use the latest technology from Germany. It has a 6mm-thick tempered glass that guarantees sturdiness of the scale, and a backlit LCD display. The weighing scale has a small footprint as well, with dimensions of 12 x 0.9 x 12 inches. Many reviewers .com agree that this is a no-frills, basic digital bathroom scale. I, for one, like that setting it up is basically a breeze. Simply put the two AAA batteries included in the package and it is good to go. Others love the fact that it doesn’t take up a lot of space in the bathroom. It is very compact and thin, and fits well next to the bathroom sink. Plus, with its backlit LCD display, you can still see your weight reading even when it is dark. This body weight scale is really designed for use in the bathroom. It has a rubbery underside thus it won’t slide around the floor that easily. It is also relatively lightweight at 3.9 pounds thus you should be able to move it when needed. But there are complaints that this unit can be inconsistent at times. Most of those who have tried using say the key is putting this on a flat surface. They say that it is likely that the bathroom scale is inconsistent in weight reading because it is not placed on a flat surface. Eatsmart Precision Plus is another good buy for people who want to keep track of their weight loss quickly and easily. It boasts of EatSmart’s patented “Step On” technology. With this feature, the bathroom scale instantly starts when you step on it. The unit will display your weight reading in 1-2 seconds on a cool, blue backlit LCD screen. It also has four precision sensors that can ensure accurate weight measurements. It has a slim and ergonomic design so there should be no problem finding a place for it inside your bathroom. It is also a bit wide at 15 inches, some three inches wider than the other weighing scale in this list. This digital bathroom scale is a solid choice if you’re looking for a user-friendly weighing device. For one, the “Step On” technology used in this bathroom scale means you don’t have to tap or press buttons to wake it up. Just step onto it, and the weighing scale will show your weight in a second or so. In terms of accuracy, I can say that this can pretty much hang with the best of them. Reading reviews .com, many people say that it is very accurate. They say that you will get the same weight no matter how many times you step on this bathroom scale in a row. Not all owners are fond of the wider bathroom scale unit, though. They say that the platform is a bit wide for small bathrooms. This digital glass bathroom scale has a relatively small 1.2 inch LCD display.Despite being smaller compared to those of other best bathroom scales, the LCD is easy to read because of its very bright backlight. There are four load sensors that are placed at each corner of the scale to provide accurate readings. It has a durable, ultra-slim tempered glass that can resist cracks and breaks. Of course, you have to weigh under400 pounds so that it won’t break when you step on it. Like most of the units in this list, this bathroom scale can measure in pounds, kilograms, and stones. It is made of tempered glass, which many owners say is very sturdy and safe to stand on. To turn on this scale, you simply have to tap on the scale. Then it would turn on and off automatically. I like this bathroom scale for several reasons. One is that its maker gives a 30 day money back guarantee. It’s something not all makers of bathroom scale units offer to their products. The platform is also wide enough for most people to stand on comfortably. The backlit display, while smaller compared to those of other bathroom scales, is bright. And it automatically shuts down after 15 seconds of inactivity to save battery life. But I just wished that the bathroom scale doesn’t slip that easily, especially on tile floors. One of the first things you will notice about Ozeri ZB19 Rev digital bathroom scale is that it has a visually stunning design.It has a 5.5 inch dial with digital display, giving it a unique combination of a retro and contemporary look. The oversized platform is next to the 5.5 inch dial and digital display. It is made of tempered glass that is impact resistant. Equally interesting is a built-in alarm that will remind you to measure your weight at the same time each day. There are also four high precision sensors that can measure people weighing up to 400 pounds, with 0.2 pounds increment. It also makes use of an advanced technology that instantaneously starts the unit the very moment that you step on the platform. There are two things that really stand out for me. One is its design which practically separates it from the rest of the field. There are only a few units that are designed like this unit. The combination of 5.5 inch dial with digital display gives you the impression that modern meets retro in this digital bathroom scale. Also, the daily alarm of this bathroom scale makes it different from the other products in this list. If you are the type of person who often forgets to take your weight on a daily basis, then this is the right unit for you. But be forewarned--- the manufacturer discourages placing it in a room that gets very humid or steamy. That may mean you have to put this in another room, especially if you can’t give up on those hot, steamy showers. Balance From C400SV may look like your ordinary bathroom scale but it isn’t. This scale can show your current weight and then remind you of your last weight.Indeed, this is a very smart digital bathroom scale that you would want in your home. This bathroom scale also has a Smart step-on technology. Yes, this means that you no longer have to turn on a switch or tap the platform to start the scale. You simply have to step on it to get your weight reading. The manufacturer of this digital bathroom scale is also throwing in a body tape measure for free. Obviously, the ability of this digital bathroom scale to remind you of your previous weight reading is what sets it apart from the other units in this list. Your current weight will be flashed in blue back light. Your last weight, meanwhile, will be displayed in a green back light. I also like that the unit instantly turns on the moment you step on it. I particularly liked that there are non-slip feet on the bottom of the unit. It prevents the unit from sliding in the bathroom floor. The 4 AAA batteries included in this bathroom scale are also easy to source. If there’s anything that I am concerned about this unit, it may have to be its inconsistency. There are times when the first reading has a different measurement from the second reading, at least according to those who have used it. Ozeri Precision Digital Bath Scale can measure weight ranging from 11 pounds to 396 pounds. It has a 13 inch by 13 inch surface with a 6mm thick tempered glass.It weighs around 4 pounds thus there should be no problem moving it when the need arises. Like most of the bathroom scales in this list, you can be assured of the accuracy of this unit. It can display weight readings in increments of 0.2 pounds. It is powered by a 3V battery. To conserve battery life, the unit instantaneously shuts down after detecting inactivity for 10 seconds. I like that this digital bath scale is made of glass and thus easy to clean. You simply have to wipe it with a piece of dry cloth. It also looks good in the bathroom, with its tempered glass construction. Rounding out the list is this digital bathroom scale from Azorro. It is loaded with four gauge sensors that can enable it to accurately read weight readings on a consistent basis. The platform is made of 6 mm thick tempered glass. It can resist cracks, breaks, and chips. It is also strong enough to last for many years. Precision Digital Bath Scale can show weight readings with increments of 0.2 pounds. It is capable of weighing up to 396 pounds. This bathroom scale maybe of the no-frills type but it works well. It can accurately measure your weight. Step on it and you’ll see your weight reading. When you step off it the unit automatically shuts down. It is powered by three AAA batteries which are supplied in the product package. A common complaint, though, is that this bathroom scale isn’t as accurate in detecting weight when it is placed on a carpet. I think that you may have to put it on a flat surface so that it can get more accurate weight readings. These are the top 10 bathroom scales that I highly recommend if you are in the market for a good weighing scale. Sure, these bathroom scales aren’t as advanced as others you may find like those units that can measure BMI or body fat percentage. But at least, you won’t be confused in using these bathroom scales as these units will only show what matters to you--- your weight! Plus, these best bathroom scales are affordable. These will also look good on your bathroom. Indeed, you won’t regret buying any of these bathroom scales.